With the threat of global climate change and the global energy crisis, the U.S. and the world are realizing the need to use more renewable energies to produce our electricity and fuel our vehicles. As the need has increased, the renewable energy field has experienced great growth. The wind industry alone has the potential to support over 600,000 jobs in manufacturing, installation, maintenance, and supporting services by 2050. Therefore we need to do our due diligence and ensure that our students are learning about renewable energy in their classrooms throughout their K-12 education. Renewable energy education also provides an opportunity for hands-on, team-based learning on real-world topics. One example of renewable energy education is the KidWind Challenge. 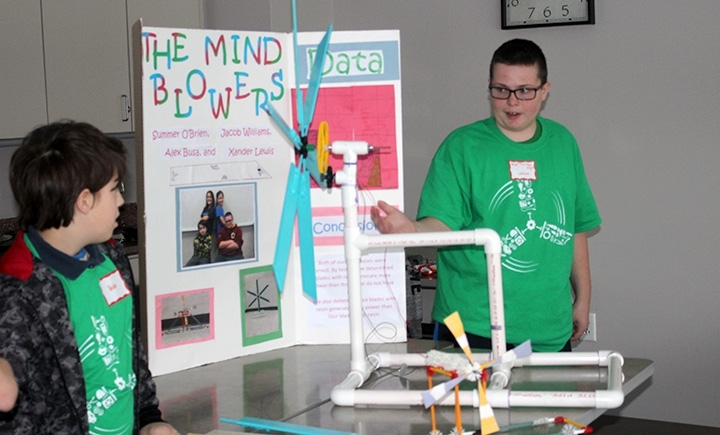 The KidWind Challenge is an engineering design competition in which students compete by constructing wind turbines to generate as much electricity as possible, while learning about the advantages of wind energy. Students are judged in three areas: (i) turbine performance in the wind tunnel; (ii) turbine design quality and process; and (iii) knowledge of the wind industry. Dabney S. Lancaster Community College in Clifton Forge, VA on April 8th. The top three teams in the Middle School and High School divisions from each regional Challenge will be invited to compete in the National KidWind Challenge in Anaheim, CA at the AWEA Windpower Conference in May 2017. In preparation for Nationals, CWE will offer a Winner’s Review Event at JMU in April. Click here for more information about the KidWind Challenge in Virginia and click here for a video from a past challenge. Registration for these events opens in November on the KidWind Challenge website. New this year, in an effort to encourage new teams to compete in the Challenge, the CWE is also offering a First-Time Coach Mentoring Program. Coaches who sign up for this program will be paired with a JMU student who will mentor and prepare them and their team for their respective regional Challenge. The JMU students will, concurrently, be taking a course on wind energy and the KidWind Challenge from CWE faculty/staff. To sign up for the mentoring program please contact Remy Pangle at panglerm@jmu.edu or 540-568-8768. Article by: Remy Pangle, Associate Director and Curriculum Coordinator, Center for Wind Energy at James Madison University.